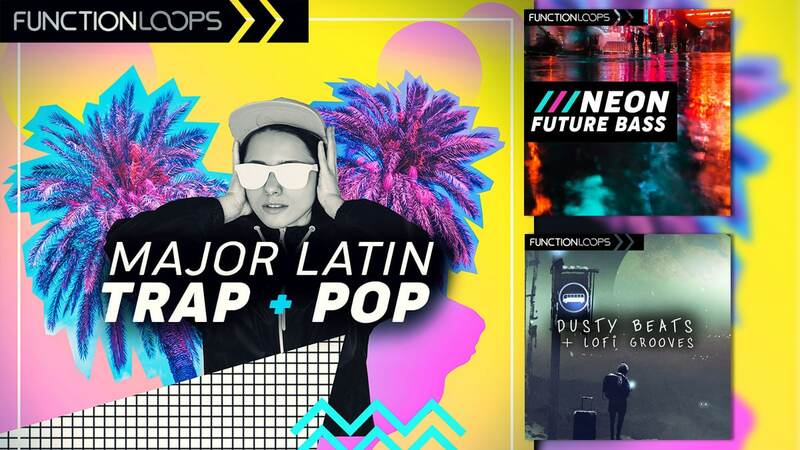 Function Loops has released Major Latin Trap & Pop, Neon Future Bass and Dusty Beats & Lofi Grooves, three new sample libraries. Major Latin Trap & Pop ($17.90) is a new sample pack inspired by Bad Bunny, J Balvin, Farruko, Ozuna and similar names, dominating the charts around the globe today. It features a blend of Trap beats, Reggaeton vibes & future Pop sounds. Also, every kit is loaded with professional vocal acapellas. Neon Future Bass ($17.90) brings an interesting blend of melodic Future Bass with Synthwave and retro vibes. It contains drums, basslines, melodies, arps, guitars, pianos, FX loops and all the rest from the demo preview. Also, every kit comes with loops, shots, MIDI and presets for Sylenth1. 100% royalty-free. Dusty Beats & Lofi Grooves ($17.90) is a crate of crackly vinyl beats and retro dusty treats. Summing up 5 construction kits and 50 sampler-ready one-shots, it is a must-have for the next groovy projects. All the sounds are fresh and original, 100% royalty free as usual at Function Loops.